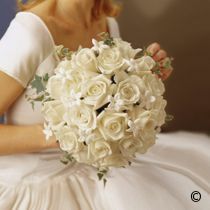 This traditional white bridal bouquet is a lavish celebration of fine large-headed roses and dainty stephanotis flowers. The subtle shades of white give a sense of timeless elegance. And the soft fragrance of this bouquet will be a lovely accompaniment as she walks up the aisle. Featuring 12 white Akito large-headed roses, 12 stephanotis blooms and 8 white large-headed roses with variegated ivy in a large bouquet holder. This hand-held bouquet is approximately 30cm in diameter.